Writers know it instinctively: Verbs make a sentence zing. Grammar gurus agree: Drama in writing emerges from the interplay of a subject (noun) and a predicate (verb). Constance Hale, the best-selling author of Sin and Syntax, zooms in on the colorful world of verbs. Synthesizing the pedagogical and the popular, the scholarly and the scandalous, Hale combines the wit of Bill Bryson with the practical wisdom of William Zinsser. She marches through linguistic history to paint a layered picture of our language from before it really existed to the quirky usages we see online today. She warns about habits to avoid and inspires with samples of brilliant writing. A veteran teacher, Hale gives writing prompts along the way, helping readers try, do, write, play. 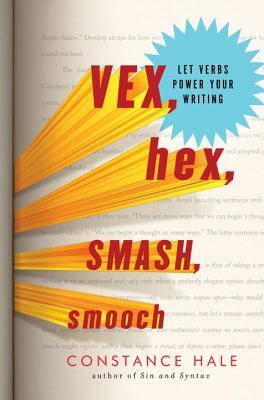 Vex, Hex, Smash, Smooch guides us to more powerful writing by demonstrating how to use great verbs with style.